﻿ Cristiano Ronaldo: "Losing is not part of my vocabulary"
12.04.2012 » Cristiano Ronaldo: "Losing is not part of my vocabulary"
There is not much left for Ronaldo to accomplish in Real Madrid, at least in what concerns individual records and stats. 32 games and 40 goals, that's how impressive Ronaldo has been in La Liga this season. When commenting his latest hat-trick obtained last night, the Portuguese didn't forget to deliver a big part of the credits to his teammates, as he has already been doing repeatedly in the past. Is it fair to say that there is a "Cristiano Ronaldo dependency" in Real Madrid? The Portuguese player single-handedly destroyed Atletico Madrid this last Wednesday, as he unblocked a game that has been far from an easy task for the Merengues. The timing couldn't have been better, since a derby will always be a derby and with a Clasico against Bracelona just around the corner, Real Madrid simply couldn't afford to drop more points. The Merengues upcoming games include a home clash against Sporting Gijon this next Saturday (12/04/2012), a trip to Munich to face Bayern next Tuesday (17/04/2012) for the UEFA Champions League first leg, and finally the decisive visit to to Camp Nou, four days after, in the following Saturday (21/04/2012). Cristiano Ronaldo: "I have to thank my teammates, because without them, I certainly wouldn't be able to score these goals. I'm not seeking personal records, but rather trophies for the club! ", said the Real Madrid star player after his brilliant game against Atletico Madrid. Last season Ronaldo scored 53 in all competitions for Real Madrid and he's already one goal away from that mark, with still a minimum of 8 games left to be played (six in La Liga and at least two in the UEFA Champions League). The Portuguese player also shared his view on how hard the game against Atletico Madrid actually was and gave voice to his delight for playing an important role on his team's victory. Cristiano Ronaldo: "It's true that we were all aware that this game was going to be very difficult. Atletico Madrid played really well and with a great intensity. I'm truly happy for having helped, by scoring and assisting for goal", confessed the man leading the Pichichi standings, with 40 goals in 32 games. When the journalists requested Cristiano Ronaldo to preview the importance of the Clasico coming up next week (on the 21st of April), the Portuguese legend agreed with the idea that it could turn out to be decisive, but only in the case the Merengues are able to pick a shocking win at the Camp Nou. 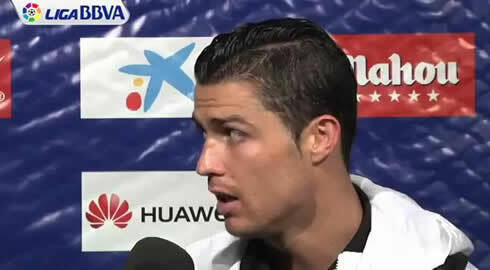 Cristiano Ronaldo: "We can't start thinking La Liga is already won, far from that actually! However, if we are able to win at the Camp Nou against Barcelona, we'll be closer than ever. I don't think about a different scenario than that one, because losing is a word that isn't part of my vocabulary..." alerted Real Madrid's ace, Cristiano Ronaldo, when previewing next week's exciting clash between the two strongest teams in football over the past few years. Real Madrid next game is for La Liga, against Sporting Gijon, this next Saturday (14-04-2012). In the meanwhile, you can watch Real Madrid vs Sporting Gijon, Levante vs Barcelona, Norwich vs Manchester City and Liverpool vs Everton, all from our football live streams section. Cristiano Ronaldo is expected to be on the line-up, when Real Madrid hosts Sporting Gijon, this weekend.